Come ice or come sleet, on Valentine's Day, florists conquer all! Click here to read the article in the Pittsburgh Post-Gazette featuring Cheryl Bakin, owner of Parkway Florist. with hotel logistics, source product and rally her designers before her shop, Parkway Florist, delivered welcome arrangements to several hotels hosting several dignitaries for last week’s G20 Summit. 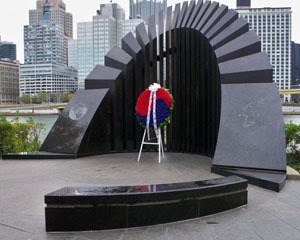 Oh, and she had to figure out how to make a wreath that looked like South Korean flag, for a ceremony at the Korean War memorial on the banks of the Allegheny River. ASIAN INFLUENCE Parkway Florist in Pittsburgh made this wreath for the South Korean State Department during the G20 Summit. The red and blue proportions had to be exact to balance the ying and yang. Bakin's shop was one of several helping welcome world leaders to Pittsburgh. She was quick to minimize her role and give kudos to Design Space , an event-only florist that provided the flowers for Mrs. Obama's dinner at the Theresa Heinz-Kerry estate and a luncheon at the Andy Warhol museum. Harold’s Florist provided numerous fruit baskets to the Chinese delegation. Karen Farrell of Chris Puhlman Flowers told the Post-Gazette that her shop assembled arrangements for Air Force One and for delegations from India, Indonesia, Japan, Germany, France and South Africa. She handled the orders through airline caterers, and like Bakin, didn’t get the first one until a day before the summit began. When the U.S. delegation’s order didn’t come, Farrell offered one anyway. When she got the go-ahead from the military, she and her staff scrambled to make another tight deadline, sending two floral arrangements "and a note … thanking the president and first lady for bringing the world to Pittsburgh." One arrangement was red, white and blue. “The other arrangement was — of course — black and gold with sunflowers and two Steelers teddy bears for the president's daughters, Sasha and Malia,” the paper reported. Bakin kept her pals updated throughout the summit, with arrangement descriptions and some other colorful moments. She particularly liked seeing the flight crews leaving the hotels to board their jets with supersized American provisions: Philadelphia cream cheese, jumbo jars of peanut butter and Craftsman leaf blowers.